5:00am – I awoke to the sound of birds singing. The alarm wasn’t set to go off for another hour, but there was no chance of me getting back to sleep – my mind was on one thing: I had a mountain to climb today, literally. Snowdon. I had breakfast and within half an hour was out on the bike. 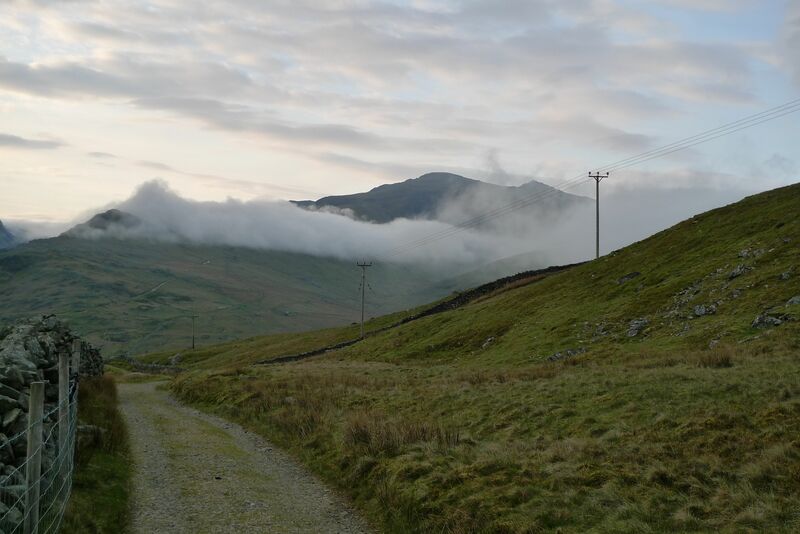 I was staying in a cottage near Rhostryfan, which left me an hour riding to get to the bottom of Snowdon. 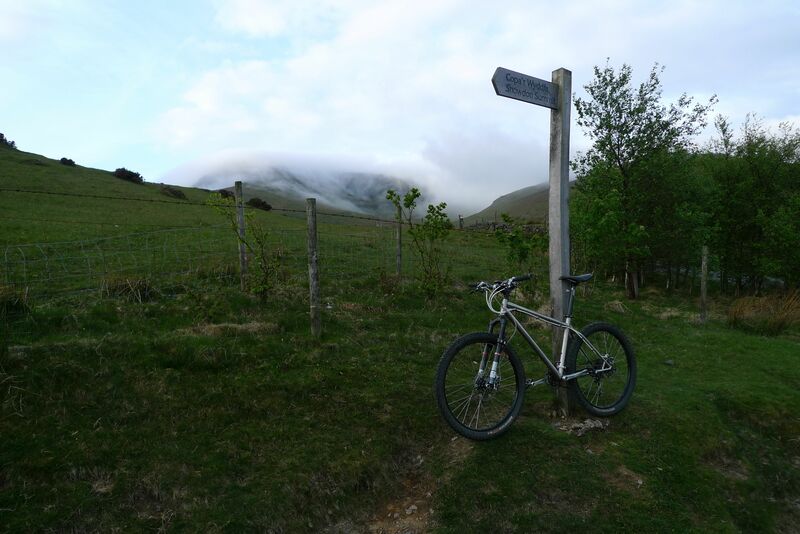 6:19am – I’d ridden over the top from Waunfawr. On the way down towards Llanberis, I caught my first sight of the summit. 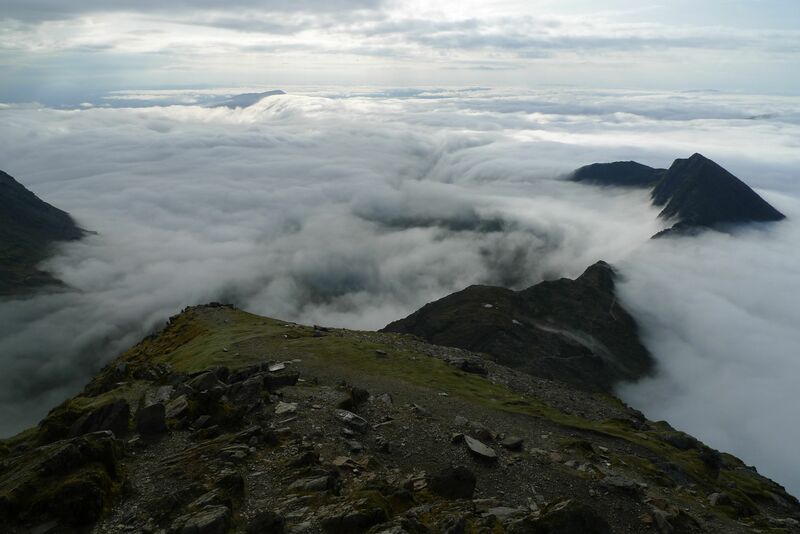 Snowdon was clear of cloud, so I might be in the chance of good view from the top. 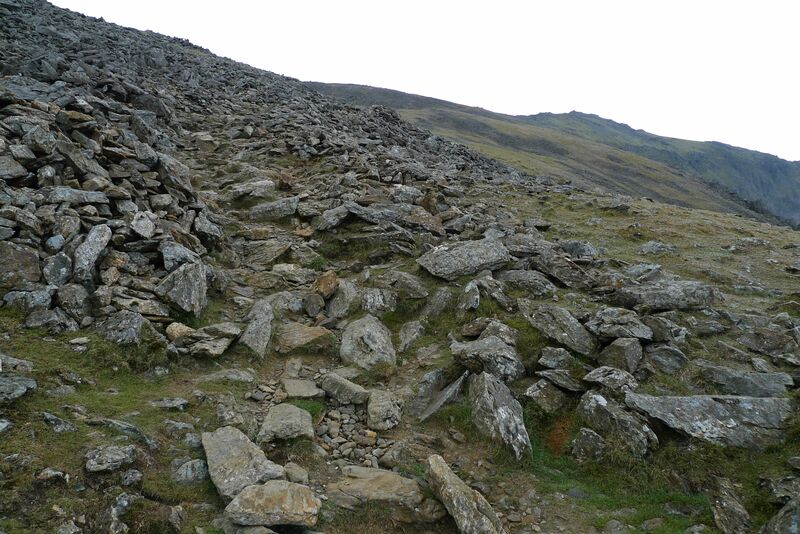 6:40am – I’d reached the gate at bottom of the Llanberis path in just over an hour, with 500m of climbing done already. And it was all uphill and off road from here. 7:41am – Clogwyn Station. The easy bit of the Llanberis path was now behind me, but not before an 600m carry up the steep slope past Clogwyn D’ur Arddu. The riding had been good, bathed for the most part in early morning sunshine. The trail was predictably rocky, but one of my goals was to commit to riding as much as possible. The section beyond the Station was too steep to ride too, so I was faced with a further push/carry. 8:00am – Back on the bike and pedalling. 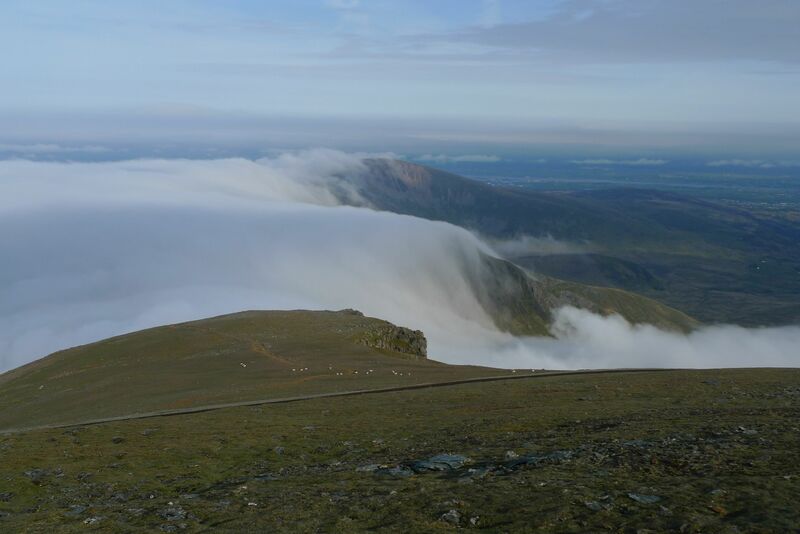 I could now see the beginning of my descent, the Snowdon Ranger, picking its way across a broad shoulder below the mountain railway and into the cloud below. 8:10am – At the saddle between Carnedd Ugain and Snowdon, I got my first look down into the valley below. Filled with clound, the view was awesome. The summit clear as crystal above, I hadn’t got far to go now. 8:15am – The Summit. 1 hour 35 mins and 786m of ascent from the Llanberis Path gate. The view was brilliant. 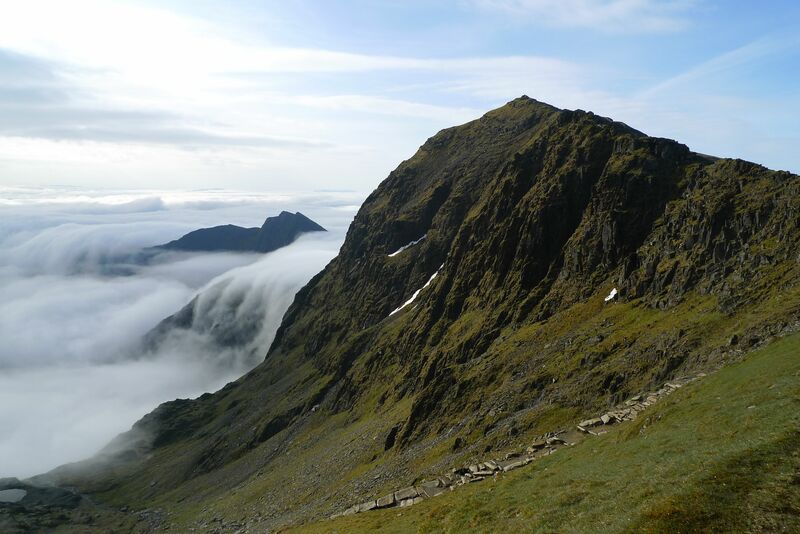 The cloud seemed to lap against the steep faces of Lliwedd and Crib Goch like the sea against the cliffs. I chilled out here for a few minutes, took some photos and ate some food. I was the only one here. The whole mountain to myself. Never mind the thousands of people who’d been here before me, I was the first person that day. 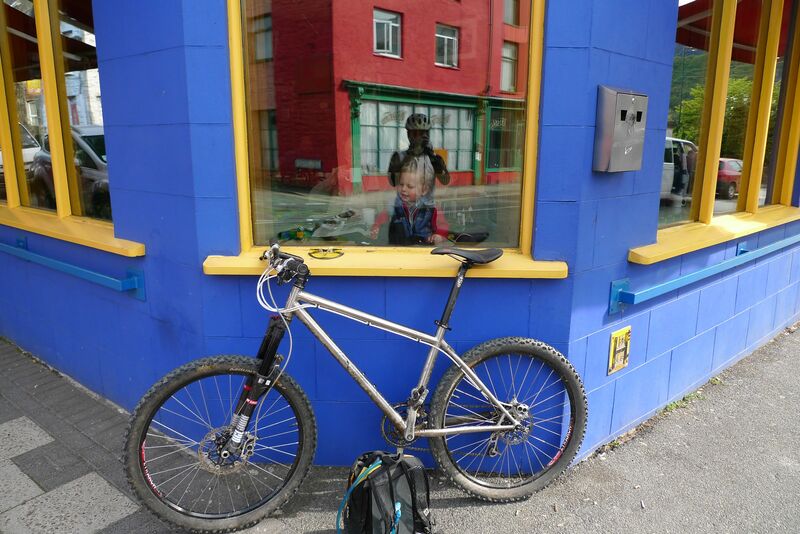 I reflected briefly on the amount of the Llanberis Path I’d actually ridden – probably 75-80% by distance, which I was pleased with. 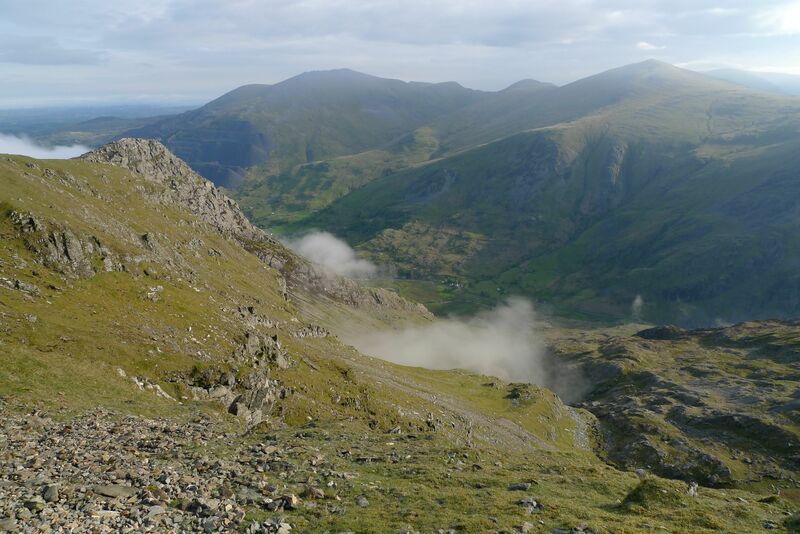 8:23am – I started my descent on the Snowdon Ranger. The upper part was a reversal of the granite steps I’d climbed to summit cairn. With these out of the way, I could cross the mountain railway track, I take the trail I’d seen on the way up. It was fast and loose, resembling fine scree. Changes in direct were better made from the rear of the bike rather trying to guide the front. As the trail steepened, the fine scree seemed to get progressively larger until the trail began to wind between increasingly large rocks. Each meter descended needed to be met with greater conviction and commitment. 8:35am – At the back of my mind, I couldn’t help but think of the consequences of even a moderate crash, injury or mechanical. Consequently, I did back off a bit, and when I did stop to look back up at the summit, I could see the severity of the trail I’d descended so far. There were to follow a few bits by far too severe for me to ride, which considerably exceeded my skill level. I gracefully carried a these sections fairly pleased with what I’d ridden further up. The trail opened out further down the valley, and I was able to open things up again and weave a line through the rocks and roll over the undulating grassy sections. Finally, I reached the turn uphill for “Telegraph Valley”. A grassy push lead to a gate and short climb past that took me over a small saddle and begin a real blast of a descent back down to Llanberis. 9:31am – Pete’s Eats. Henry and Beth were there to greet me too, and have a cup of tea and a bacon and egg roll ready and waiting. The perfect end to a great morning’s ride. All the photo’s from the ride are on my flickr site.